Lexus has heavily revised its flagship LS model, with new styling in line with the recently launched GS. The new car has been unveiled at the Paris Motor Show. The styling is much more distinctive than before, particularly at the front with a trapezoidal grille. All of the exterior lighting can be specified with LED technology and there are new daytime running lights. In the cabin there’s a new touchscreen, the largest on the market, along with redesigned controls in the centre stack. There’s also a smaller steering wheel and high tech flourishes like a GPS system fitted to the clock so it maintains accurate time and a leather trimmed key. Refinement has been improved, with revisions to the engine as well as improved insulation to reduce road and wind noise. Lexus is calling it the quietest car in its class. Comfort has been improved too, with revisions to the heated and cooled seats, integrating them with the climate control system. The 4.6-litre V8 engine has been improved with reduced emissions and improved power output – the LS460 has 387PS. The LS600h, which uses a 5.0-litre V8 engine in combination with an electric motor, produces combined peak power of 445PS. 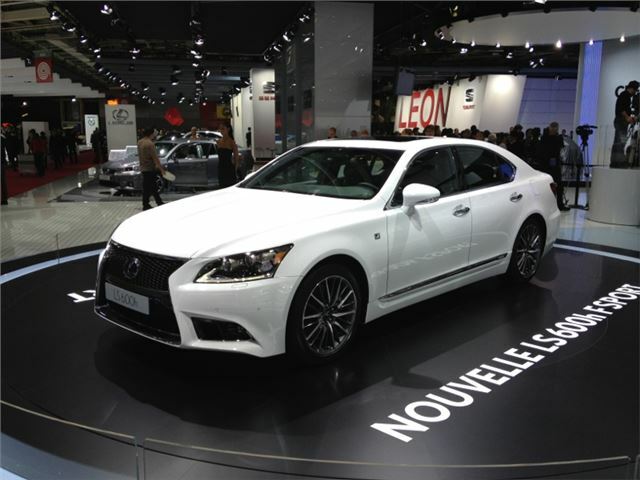 Emissions for the LS460 are 249g/km, while the LS600h emits 199g/km.